It may be already asked question in somewhere but I am struggling! I have a four wheel robot which I want to drive it to perform 90-degree left/right turn, I am using the MPU6050 3dof to get angles, however everything is ok when the DC motors are off and the readings from the MPU6050 are pretty good. But when the DC motors are on, the readings start to be increase randomly. 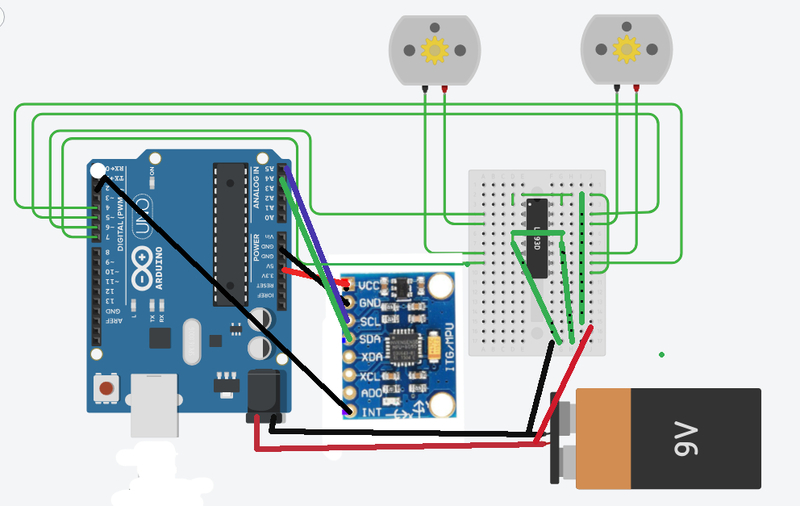 I tried to use a different power supply to the DC motors and the Arduino, but with no solution. At the end when I reset the Arduino everything was back to be normal even if the DC motors are on! Any help will be appreciated and I am open for any suggestion. Add capacitors to the motors. For point 2 you need two or three small ceramic capacitors (10nF to 100nF) per motor. This will reduce the EMI produced by the motor, and the improved pullups should reject EMI easier. You can just change ground port for your MPU6050 or for your motors(experiment with different choices). You have another ground port near pin13. As far as I know some of them are for analog devices and some of them are for digital (to avoid interference). Adding capacitors may not help. If none of the methods will help, try to add an inductor to your circuit. Please, try that and write here if these were helpful or not. Update: As per this site the problem is caused by data cables. In addition, I would like to mention that Arduino standard pin cables are very noisy, so all connected modules which use high data rates or which are very sensitive to data errors (for example, nRF24L01+) will have strange behavior. Temporary and harsh workaround: You could reset your Arduino after first initialization process (at the end of setup) then, save a flag("1") to EEPROM so it will not reset each time you start Arduino (warning: EEPROM cells can be rewritten only 10000 times). Not the answer you're looking for? Browse other questions tagged motor interrupt mpu6050 or ask your own question. How to properly use volatile variables in Arduino? How to make two wheels turn only for a particular amount of time?